As the nights close in and the snow line creeps further down the valley, now seems the perfect time to reflect on a glorious summer – and autumn – of cycling. Over the coming weeks we’ll post a series of blogs devoted to the best cycling the region has to offer, whilst highlighting all the things to look forward to throughout the coming months. We’ll focus on both individual climbs and longer rides, exploring some of the most iconic cols of the northern French Alps. We begin, however, with a jaunt up the lesser known – but seriously stunning – Col de l’Encrenaz. Sitting at 1433m above sea level, the Col de l’Encrenaz is not the highest of local climbs, nor, at just over 6km in length, is it the longest. It is, nevertheless one of the most challenging – averaging a consistent 8.9%, with a morale sapping 10.9% in the final kilometre. The climb itself starts just outside the picturesque Savoyard village of Essert Romand, some 2 kilometres south of St Jean d’Aulps. Signposted to La Cote d’Arbroz and the Col de l’Encrenaz, the road ramps up to a daunting 10.5% for the first kilometre, before settling down to a constant 8% for the next two. La Cote d’Arbroz – with the snow capped Nantaux behind it. Tough though this climb is, it rewards the effort: the views across the Vallee d’Aulps as you hairpin towards La Cote d’Arbroz are truly spectacular, with Morzine and Montriond below, framed by the peaks of Nantaux and the Ardent Valley. 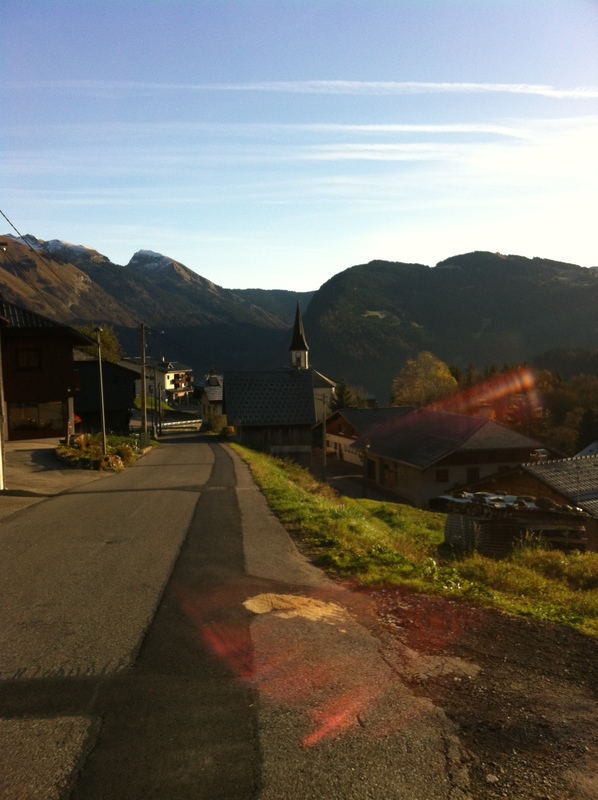 Passing through the village, the road straightens and the chalets become sparser, replaced by thick woodland and the steeper slopes of the Rod d’Enfer reserve. With just 1.5kilometres to the top, the road offers riders the briefest of respites, plunging down for some 200m before a tight left hand bend marks the start of the final push for the summit. One of the many admirable traits of the French is their tendency to place both cafes and water troughs at the top of mountain passes. 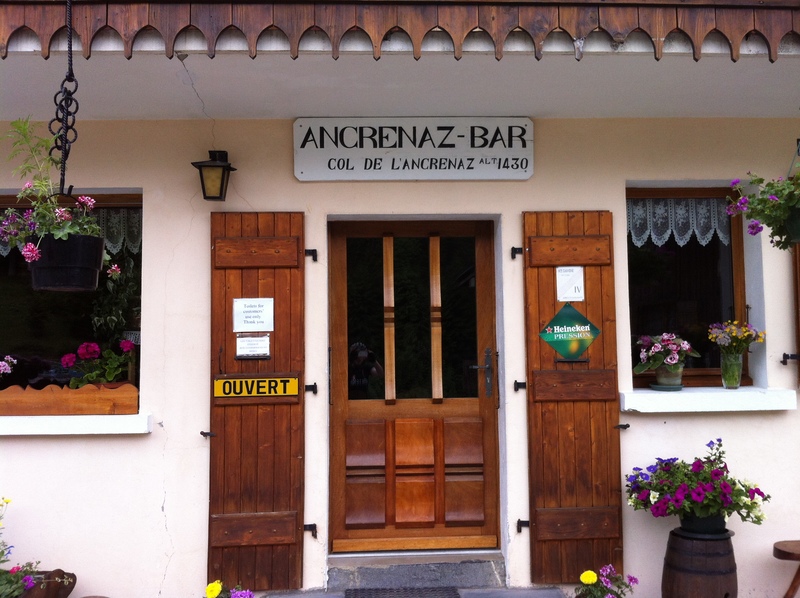 Encrenaz is no different; reward yourself with a well earned coffee stop, or simply fill your bidon with fresh water from the purest of mountain springs. The pass itself nestles beneath Mont Chery – part of the Les Gets ski area in the winter, but in the summer the playground of walkers and cattle. To the east, you gaze toward the heights of Avoriaz; to the west the Giffre and Arve valleys, and the impressive peaks of the Chaine de Aravis. The climb to the top of Encrenaz is genuinely testing – a great ride in its own right. It is, however, the descent from the western side that makes this ride what it is: a fast, spine-tingling 4km plunge through the woodland and alpine pasture of the Roc d’Enfer. It’s rare to come across vehicles of any kind, allowing you to pick your line with the freedom usually reserved for the professional peloton. Just remember to smile.